This is the privacy notice of PETER SOMMER TRAVELS LTD. This privacy notice aims to give you information on how we collect and process your personal data through your use of this website, including any data you may provide through this website when you sign up to our newsletter request a brochure contact us about booking a tour or any other matter. Peter Sommer Travels Ltd is the controller and responsible for your personal data (collectively referred to as [“COMPANY”], “we”, “us” or “our” in this privacy notice). Our contact details are Peter Sommer Travels Ltd, 102 Monnow Street, Monmouth NP25 3EQ, Tel: 01600 888 220, email: info@petersommer.com. For all data matters contact Julie Sibley on the details above. Peter Sommer Travels Ltd is the controller and responsible for this website. Note that we may process your personal data for more than one lawful ground depending on the specific purpose for which we are using your data. Please contact us on info@petersommer.com if you need details about the specific legal ground we are relying on to process your personal data where more than one ground has been set out in the table below. You can ask us to stop sending you marketing messages at any time by following the opt-out links on any marketing message sent to you or by emailing info@petersommer.com at any time. Where you opt out of receiving these marketing messages, this will not apply to personal data provided to us as a result of booking a trip with us. We do not buy or rent information from any third parties. 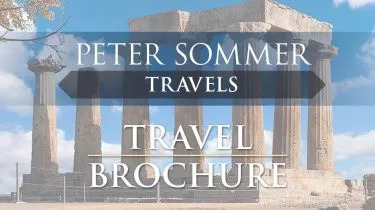 If you receive information from Peter Sommer Travels, it is because you have requested it – or a friend / colleague has requested it on your behalf. At any time you can be removed from any or all of our databases and receive no more information from us. We have taken security measures, consistent with international information practices, to protect your personal information. Providers acting as processors based in our destination countries who provide destination management. We ensure all electronic communications are encrypted and protected by suitable industry grade anti-virus software. All our staff and consultants have been trained in keeping data safe. Please contact us by emailing info@petersommer.com if you want further information on the specific mechanism used by us when transferring your personal data out of the EEA. To exercise all relevant rights, queries or complaints in relation to this policy or any other data protection matter between you and us, please in the first instance contact our data representative on info@petersommer.com. Traveling as a guest on the Alexander the Great Tour in Turkey was a highlight of my life. This was my first trip abroad and my first to Turkey. The food was outstanding, the accommodations comfortable and convenient, the tour guides knowledgeable and courteous, and the cities and historic locations visited were incredible. I look forward to my next Peter Sommer tour.